"I paint myself because I am so often alone and because I am the subject I know best," mused the Mexican artist Frida Kahlo of the 55 self-portraits she painted. “I am looking for a deeper likeness than obtained by a photographer,” wrote Vincent Van Gogh of his 43 self-portraits. Indeed, one of the most consistent themes running through the past 400 years of art history, in some ways perhaps the only constant, is that of the self-portrait performed by artists as dissimilar as the renaissance Leonardo de Vinci and the 20th century conceptualist Marcel Duchamp. And it was with that thought in mind that I surveyed the strong show “Close-Up: Contemporary Portraiture,” on view through September 7 at the Southampton Arts Center. The show, curated by Leila Heller with Kelly Behun, is about portraiture in general and includes portraits in every possible style and medium of individuals in every social strata rendered in the style of the individual artists. The show is presented jointly by the Leila Heller Gallery of New York City and the Southampton Arts Center, which occupies the former Parrish Art Museum building on Jobs Lane in Southampton. The portrait has always provided the bread and butter income of artists whose developed style attracts customers seeking to have their likeness memorialized in a unique way. 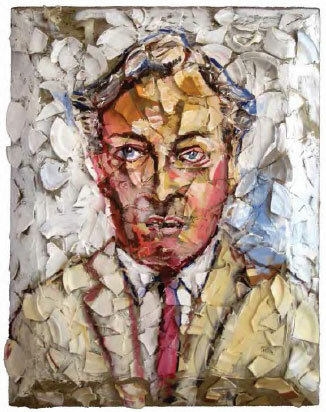 Julian Schnabel’s Portrait of Geoffrey Bradfield, rendered in the artist’s early signature style of broken-plate painting, is one example of this kind of portraiture that is included in this show. "Portrait of Geoffrey Bradfield" by Julian Schnabel, 2009. Plates, Bondo on wood, 60 x 48 inches. Another example of signature-style representation is the staged portrait photography of Annie Leibovitz, whose Alice in Wonderland tableau of a ghoulish Donatella Versace and others is smartly included. "Alice in Wonderland, Donatella Versace and Rupert Everett with Natalia, Paris" by Annie Leibovitz, 2003. 20 x 24 inches. But the standouts in this show for me are clearly the many self-portraits wherein the artists are positioned in the forefront instead of having their world view lurking behind someone else as the subject. This genre carries the show, for me, and makes it something greater than a random collection of head shots and copied newspaper photos. There is evidence in this show, once again, that it’s the Summer of Jeff, with artist Jeff Koons seemingly everywhere: a five-floor show at the Whitney, a massive topiary at Rockefeller Center, and appearances on the Charlie Rose and Stephen Colbert shows. His oleaginous sales pitch promoting the empty is featured in nearly every media outlet in America. In the “Close-Up” show, an early self-portrait when he was a youthful 34 shows him posing with live pigs. It’s nearly too perfect for words. Jeff Koons Magazine ad, 1988. Artist Ike Ude is uniquely photogenic and has posed for extraordinary photos throughout his career, mixing fashion and fine art. Here he mixes styles and props from around the globe in his self-portrait, Sartorial Anarchy #6, a pigment print. It’s less brooding than much of his work and the summer outfit goes well in this season. "Sartorial Anarchy #6" by Ike Ude, 2013. Pigment on satin paper, 54 x 36.1 inches. Edition of 3, 3 AP. Marina Abramovic moved up the ladder recently with a retrospective at MoMA that featured a Brooklyn staring contest entitled The Artist Is Present, wherein passersby were invited to sit across from her and, well, stare at her. The piece had a creepy narcissist new age smell to it, but reviewers gave her the benefit of the doubt as much of her work is considered important. There was no doubt whatsoever early in the summer when an ad she took out ricocheted about the art world: She advertised four assistant positions with upscale requirements and duties … but finished each with text that the positions were unpaid. In the “Close-Up” show in Southampton, Abramovic poses with a bird of prey, again too perfect for words. "Portrait with Falcon" by Marina Abramovic, 2010. Silver galatin print, 12 x 12 inches. Cindy Sherman’s entire oeuvre is self-portraits, and she has enjoyed critical success as part of the “pictures generation,” a group of artists that appeared in the ’70s who explored the way visual media informed our consciousness. Her many self-portraits as a monster and her film “Office Killer” seemed like an aside, but loom too large in her work for her to be listed as another passive pictures generation artist. The Southampton Arts Center show includes a 1989 “Untitled” self portrait of Sherman as an obese clown with baby hands and feet and a distorted pig’s nose for a navel; a scary and deliberately repulsive image. "Untitled" by Cindy Sherman, 1989. Chromogenic color print, 38 x 27.5 inches. This is a large and well curated show, but unfortunately remains on view only until September 7. BASIC FACTS: “Close-­Up: Contemporary Portraiture Curated by Leila Heller with Kelly Behun,” August 22 through September 7, 2014 at Southampton Arts Center, 25 Jobs Lane, Southampton, NY 11968. The gallery is open Thursdays through Sundays. www.southamptoncenter.org.